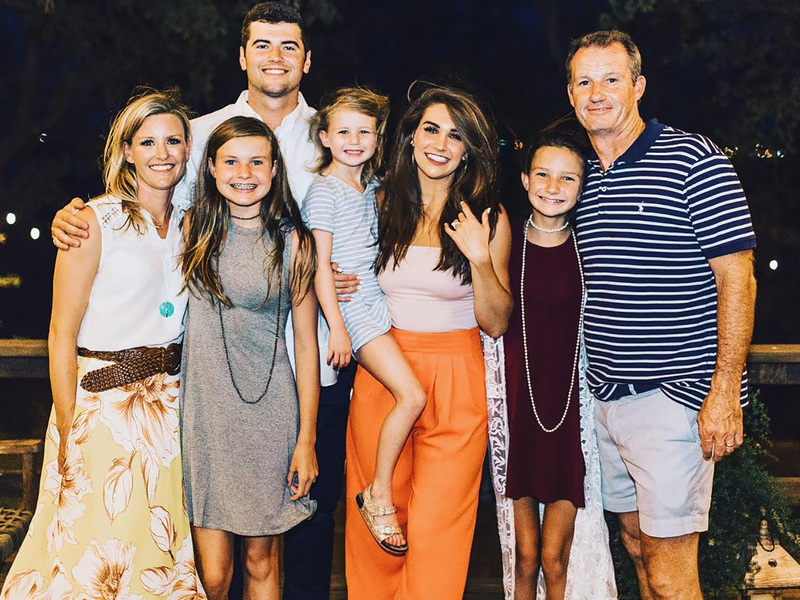 As Jarrett Stidham prepares to lead Auburn back to championship contention and throw his name into the Heisman race, he has a whole family behind him. ATLANTA – Jarrett Stidham never had a sister. And then, when he was 18, he got three. When Jarrett moved out of his mother’s home and in with the Copeland family in 2014, Kalen, Marin and Larsen were all under the age of nine. They are now 13, 11 and five years old, respectively, and they’ve only known Jarrett as their football-playing older brother, the son Matt and Katy Copeland never had, the one their daughters clowned around with in his second-story bedroom at the Copeland’s home in Texas. “He’s as much of our family as our girls,” Matt says. Matt does not permit interviews often, and Jarrett doesn’t usually give out his number. Not everything about public figures should be made public, even for an SEC starting quarterback who enters his junior season on the short list of betting favorites for the Heisman Trophy. Just 20 months ago, Jarrett spent his mornings completing junior college classes and spent his afternoons playing scout team quarterback for a nearby high school team, a few months removed from a decision that Matt says was extremely hard on the family: Jarrett’s transfer from Baylor after head coach Art Briles was fired in the wake of the sexual assault scandal that rocked the program. But without all of that—the Copelands, his decision to leave Baylor and his year away from football in 2016—Jarrett wouldn’t be here, at the Omni Hotel and College Football Hall of Fame at the center of the SEC’s footprint. No player received more spotlight on the final day of SEC media days than Auburn’s 6'3", 215-pound QB, who posted the best completion rate (66.5%) of all returning SEC passers in ’17 and finished second only to Missouri’s Drew Lock in passing yards. Jarrett posted gaudy numbers as a true freshman over three starts at Baylor before a broken ankle ended his 2015 season: 75-for-109 passing for 1,265 yards and 12 touchdowns. Two years later, he helped lead coach Gus Malzahn’s Tigers to an SEC West title, knocking off top-ranked Alabama before falling short of a playoff berth with a loss to Georgia in the SEC championship game. They didn’t finish the job, and it still stings. “Motivation,” Jarrett says. He’s the guy, Malzahn said. Jarrett instead says he’s the old guy, a soon-to-be 22-year old who felt “really old” when he learned the year in which the newest crop of freshmen were born: 2000. “I don’t even know if they know what Lion King is,” he said. Stidham’s advance scouting sessions on Washington have been only one part of what he calls a “summer to remember.” He served as counselor at two quarterback camps, the Elite 11 in California and the Manning Passing Academy in Louisiana, but it hasn’t all been football. He also proposed to his girlfriend of two-plus years, dropping onto one knee on a patio of a building nestled on a Texas lake. He was more nervous than he’d been during any pregame, so nervous that he blacked out during the actual proposal. “I don’t remember to this day exactly what I said,” he says. Stidham with his fiancée Kennedy Brown (in orange pants) and the Copelands. Kennedy Brown said yes. If her name sounds familiar, it’s because she’s a Baylor soccer player and the daughter of Houston Rockets CEO Tad Brown, one of the most powerful men in the NBA. Jarrett and his now-fiancée regularly attend Rockets games, including the 41-point loss to the Warriors in Game 3 of the Western Conference Finals in Oakland. “The one where they whipped us,” Jarrett huffs. On Thursday, he walked through the labyrinth of hallways, ballrooms and lobbies that is SEC media days. He turned one corner, and about two dozen Auburn fans hoisted memorabilia to sign in his direction. “We can’t. No time. Keep walking,” an Auburn administrator politely told Stidham. The quarterback did not listen. He scribbled his signature onto deflated, white footballs and miniature Auburn helmets, chatting briefly with fans and even asking them questions. Undecided on his next destination after leaving Baylor, Jarrett enrolled in online courses at McLennan Community College in Waco, a 12-minute drive from Baylor’s campus. While sitting out the 2016 season, he completed 16 credits in order to enroll at his next four-year college the following January. McLennan does not sponsor football, so Jarrett turned to the prep level to stay sharp, joining the Midway High School Panthers as a scout team quarterback, preparing the varsity defense for its next opponent and reading play designs from giant index cards before he convinced the coaches to create a simple 12-play wristband. Jarrett connected with the Copelands when he was 15, working a summer job in construction with Matt and Katy’s burgeoning business. The Copelands own college apparel stores scattered throughout the nation, one at Florida State, another at Iowa State and six in Texas. They build their own stores, and as recently as February Jarrett helped lay down floors or install ceiling materials. Jarrett moved here with his mother and older brother Juder at the age of nine, relocating from their home in Kentucky. When he turned 18, Jarrett could legally move in with the Copelands, and he did, having the entire second floor—a bedroom and bathroom—to himself. This is not something he speaks about often. Jarrett is making an exception Thursday, but he and Matt are still distant on the quarterback’s personal life. “I don’t want to get too in-depth,” Jarrett says. After all, life is hard sometimes, and not all of us are born into favorable situations. Some of us must make tough decisions, leaving a situation behind to find happiness someplace else. For Jarrett, that place was with the Copelands. Jarrett and Matt talk nearly every day. Jarrett texted Thursday to briefly detail his media days experience, firing the messages to his mentor while hurrying through a hotel hallway on the way to a private jet back to Auburn. He leaves Friday for California to train with a quarterback specialist. They’ll focus on his footwork and his “dirty throws,” a term for standing in the pocket to deliver darts under pressure. He’ll soon return to Auburn for fall camp, and in between he might make a pit stop in Stephenville and settle in on the second floor for a few days before the roar of college football begins.